In the early 1990's, I secured my wildlife rehabilitation license so that I could accept and care for injured wildlife, legally. 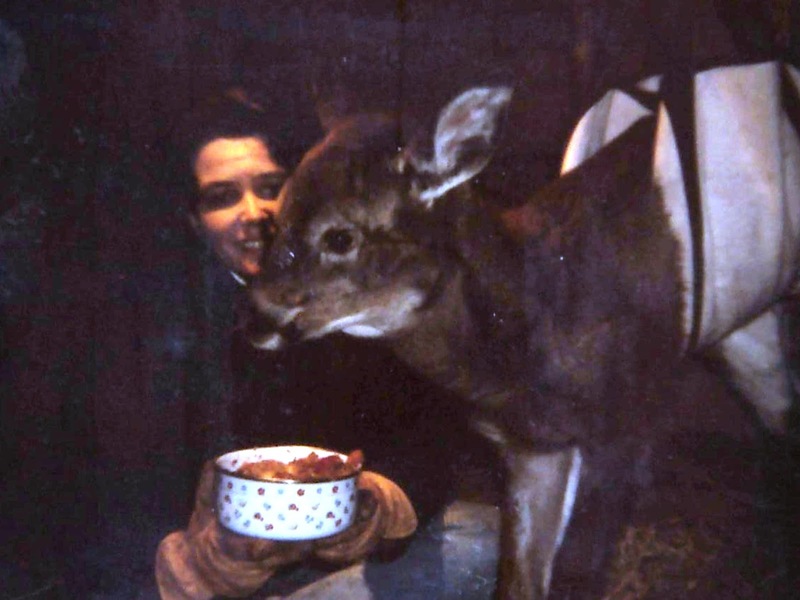 Many fascinating animals found their way to Lakeview Farm in those days. Sadly, most of them succumbed to injury or illness beyond my ability to help. However, once in awhile I was rewarded for my efforts with the successful recovery and release of my patient. In today's excerpt from Finding My Way to Moose River Farm, a helpless fawn takes up residence in our goat shed one week before Christmas and allows me to get up close to one of the Adirondack’s most ‘popular’ species. At first glance I was taken by how extraordinarily beautiful the fawn was. Its large brown eyes and black nose composed the most endearing facial expression I had ever seen up close. Slowly, I entered the shed, careful not to frighten this wild animal now trapped in a small space. Its body tensed and tried to rise as I lowered myself into the straw attempting to appear small and unthreatening. Carefully, I lifted the tail and was able to identify that the fawn was a young doe. She was very tiny, perhaps due to a late July or August birth. When I gently pinched her hind ankles she reacted by pulling them up to her torso, a good sign that she did have feeling in the limbs. My guess at this point was that she had badly torn the muscles in her groin when she went down on the ice and further complicated her injury by struggling unsuccessfully to get up. Perhaps all she needed was a long rest so that the fibers of her muscles could repair and heal. To prevent her from straining her hind limbs, I tied them loosely together with an old fleece polo wrap used to protect the legs of horses when training. That way if she did successfully rise on her own, there would be support to prevent her from re-injury. As long as I did not try to touch her she remained calm in my presence. But when I wrapped my arms around her body to hoist her into the sling, she struggled to get free. I could feel her heart pound until I let go. The sling provided her with the support she needed to stand, a vital position for ruminants to digest food properly. For approximately, two weeks the fawn, now named Phoebe, rested in the goat shed. Three times a day we hoisted her into the sling so that she could practice standing and alleviate the stress on her vital organs. With her legs still bound together, she swayed quietly in the sling seeming to accept our help. Eventually, she stopped struggling when I had to lift her. Now she was beginning to understand that I was associated with food, both hay and hot bran mash. Pheobe hung in a sling to promote proper digestion. Phoebe certainly won the lottery when she came into your life. What a caring thing to do for the creatures of Lakeview Farm. One of my most rewarding experiences is when I volunteered at a local wildlife rehabilitation facility. Love your inventive sling method!